25 May Oakcliff Tested: Wins! May 25, 2013 Forty-Two Oakcliff sailors headed out to the start of the start of the Round Block Island Race with the advice of bring extra gear, add another layer at sunset and power through the wee hours as it is going to be near freezing and then you’ll have to hike hard on the return trip. Forty-two sailors headed out and they all came back -winners. With a first, a third and the qualifications to join the Storm Trysail Club. Many of the Saplings have experience but this race tested their mettle with winds solidly above 25 gusting to near 40. Temptation Oakcliff, the Ker 50 sponsored by Art Santry, and lead by Mike Komar sailed a solid race finishing third, ahead of sister ship Snow Lion. Temptation Oakcliff will race a full season with Oakcliff trainees onboard, including inshore and offshore races such as the Halifax Race. Although the Storm Trysail Round Block Island Race is likely to have dealt out the toughest weather conditions to be seen this summer. Mike Tolsma and Vlad Shablinski raced the Ker 11.3 in the double-handed division. They were the tiny star of the race, leading everyone except for the mega racers, Rambler and Rima for the first third of the race. The excitement of their night came when they were setting the spinnaker and the sock deployed prematurely, flogged and the sail started to wrap around the headstay. The halyard also got jammed at the masthead. Tolsma was half way up the rig when the sail flogged again, came free and spun down into the sea. Shablinski made a quick decision and then laboriously hauled the sail back onboard before lowering his teammate from the rig. 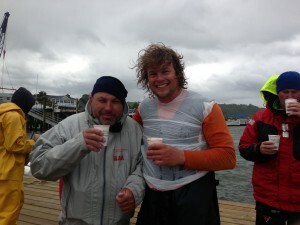 They were still laughing about the situation hours later while on the dock enjoying Sweet Tomato Bisque Soup and a fifth place finish. Oakcliff Ker 11.5 won their class but it was not without drama. Early in the race while flying the code zero in just under 20 knots of wind, the bob stay pulled through the stem of the boat and the prod snapped off. Everyone rushed forward, recovered and resumed racing and racing fast winning their class. The team was made up of supporters Mark and Sue DiSanti and Bob Zazzara were on board as they have been onboard almost every big boat regatta Oakcliff has competed in. Coach Jay Kehoe lead the team making cameo appearances on the bow. New Saplings Jake Arcand, James Downer, Charlie Singer and Hobie Ponting were thrown in at the deep end. Graduate Jeff MacFarlane who was air lifted off of his mini campaign less than a month ago got the cast off of his hand in order to sail this race and last added to the crew was Katie Mooney who will be an Acorn this summer. She had come down to cheer on the team at the start, wishing there was a sailing spot open. Due to a train delay there was, she took the opportunity and jumped on board. A lesson in making your own opportunities. The Oakcliff Farr 40, which is being campaigned by Sapling Graduates had the roughest ride, blowing out their main when reefing about 10 hours into the race. Shortly thereafter the number 3 jib shredded. The team made up of all under 25 year old sailors made the prudent decision to retire from racing but still had a challenge in that they needed to work off of the Long Island leeward shore. They managed to do so with the storm trysail and #4 jib. Once they gained windward distance they were able to sail all the way to Oyster Bay hitting speeds in the low teens in the 30+ knots of wind. This team is focused on racing in the Farr 40 worlds later this summer which is taking place in Newport RI. They are seeking sponsors and while their newfound expertise with a storm trysail will not be relevant their resilience will be. Last heard from the team enjoying a snack before nap at Jack Halyard’s, was a discussion of whether the precipitation last night was snow, sleet or sleeting rain. No matter what it was, the Oakcliff Saplings were tested and came out the other side with a whole heap of confidence earned from harsh conditions endured on top of the satisfaction of knowing they sailed fast too.